These brilliantly colored glass art sculptures are called the Pagoda Series. Inspired by the Pagoda coral that grows in the coral reefs, these dynamic underwater forms have graceful lines and bright colors that really add a splash of color to the room. This sculpture consists of 3 separate fluted bowls nesting in each other. 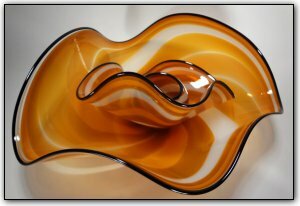 Each piece was custom shaped to fit together, creating a fascinating coral-like glass sculpture.